The top five players in the global platelet rich plasma (PRP) market contributed over 80% of the overall revenue generation in 2015, pointing towards the largely consolidated nature of the market. These players are Harvest Technologies Corporation, Arthrex Inc., Zimmer-Biomet, DePuy Synthes, Inc., and Stryker Corporation. Among these, Harvest Technologies Corporation was the frontrunner, holding 25.2% of the overall market. Its dominance can be attributed to its strong presence in the cellular therapeutics and platelet-rich plasma segments, finds Transparency Market Research (TMR) in a study. “The majority of players have a strong focus towards research and development and product innovation to strengthen their foothold in the market,” says the author of the report. 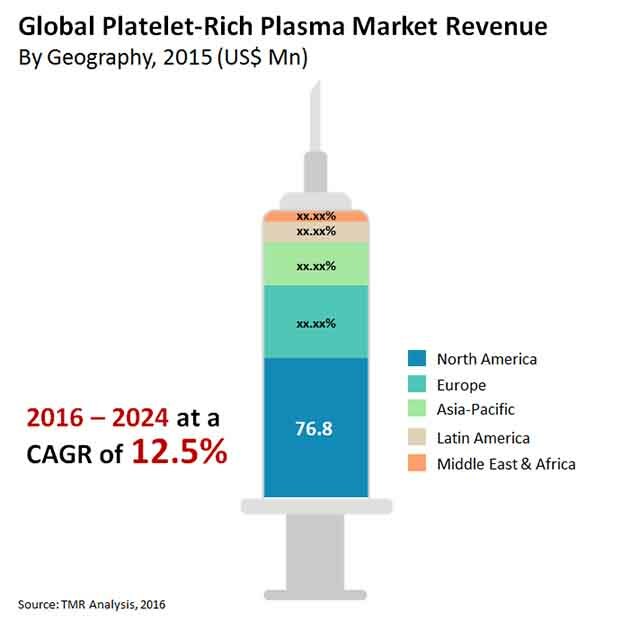 The global platelet rich plasma market was worth US$175.7 mn in 2016 and is poised to reach US$451.9 mn by 2024, progressing at a CAGR of 12.5% therein. On the basis of type, the pure-PRP segment will continue to dominate the market until 2024, accounting for 64.4% of the overall market value. Rich content of platelets and limited contamination with RBCs make this type the preferred choice of treatment. The pure-PRF segment is estimated to register a CAGR of 13.5% during the same period. Geographically, North America will continue to be the leading revenue contributor until 2024, representing 48.3% of the overall market. The increasing prevalence of orthopedic diseases and growing geriatric population are contributing to the growth of the region. Asia Pacific is anticipated to post phenomenal growth, owing to the rising awareness regarding PRP treatments and booming medical tourism sector. The widening base of patients suffering from orthopedic disorders along with the increasing cases of sports injuries is one of the primary stimulants of the growth of the global platelet rich plasma market. The U.S. Centers for Disease Control and Prevention (CDC) estimates that the number of adults in the U.S. suffering from arthritis will reach 67 million by 2030 from 52.5 million in 2013. “PRP treatment reduces injury healing time from four to six months to three to five weeks with surgery. As a result, its preference will increase substantially over the coming years,” says a TMR analyst. Rapid advancements in technologies are creating new application areas, such as hair restoration treatment, vampire facelift, and erectile dysfunction, of PRP. This, in turn, is working in favor of the global market. Moreover, the rising number of people undergoing cosmetic surgical procedures is augmenting the market. The threat of therapy failure is creating a major impediment to the growth of the global platelet rich plasma market. PRP has failed to show its efficacy in various therapeutic segments such as rotator cuff repair and total knee arthroplasty (TKA) surgery. In addition, the threat of chronic disease transfer such as hepatitis, syphilis, and other blood-borne diseases has induced skepticism regarding PRP treatment among end users. Moreover, the high costs of products and therapy combined with the shortage of reimbursement policies are negatively impacting the growth of the market.